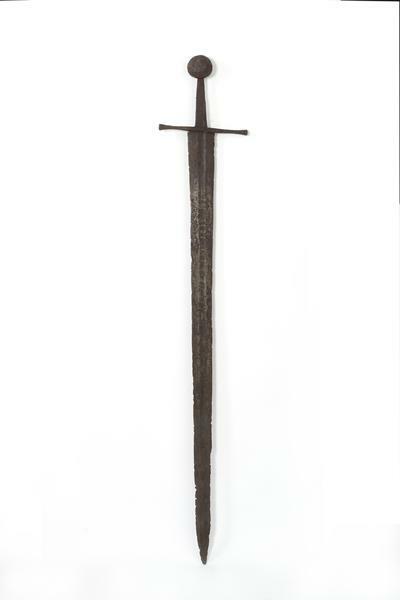 This sword was found in Whittlesea Mere, Cambridgeshire, in the 1840s. It is extremely rare to find swords of this quality in the ground as they were highly prized and expensive items of weaponry. Most medieval battlefields were cleared of useful weapons soon after violent engagements. Swords have always been high status objects used as symbols of authority as well as for warfare and sport. Swords often accompanied a warrior to his grave. 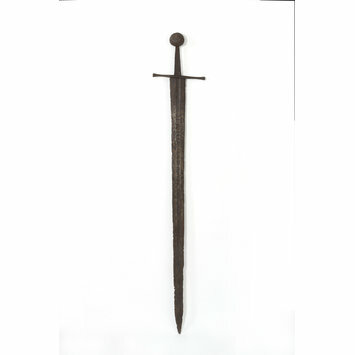 This style of sword, with a long, two-sided blade balanced by a pronounced wheel-shaped pommel and straight quillons (cross-bars on the hilt) to guard the hand, derived from the broad straight swords of the Celts and Vikings. The grip would originally have been of wood bound with leather or cord, but no trace of it remains, only the core steel tang reaching to the pommel. The medieval sword was at first designed as a cutting weapon but by around 1300, when this sword was made, narrower, pointed blades emerge in order to pierce the new plate armours. The medieval knight used a shield or armour for defence so that swords were designed almost entirely for offence to be wielded one-handed on horseback. Longer grips emerged after 1250 so that the sword could be held with 2 hands in foot combat and the quillons started to curve towards the blade as a form of defence for catching an opponent's blade. Sword, the long double-edged blade constructed of two parallel pattern welded rods to give a shallow concave medial fuller which is decorated with an inlaid talismanic inscription in latten letters on both sides. The hilt no longer survives, only the tapering tang which is hammer welded to a globular, roughly hammered disc-shaped pommel with bevelled edges. The plain quillon is straight with circular section terminals flaring slightly outwards at the tips. This sword was found in Whittlesea Mere, Cambridgeshire, in the 1840s (in the same vicinity as the Ramsey Abbey incense boat M.269-1923). It was first loaned to the Museum in 1951 by Mr George H. Bird and written on in 2002. Swords have always been high status objects used as symbols of authority as well as for warfare and sport. Swords often accompanied a warrior to his grave. 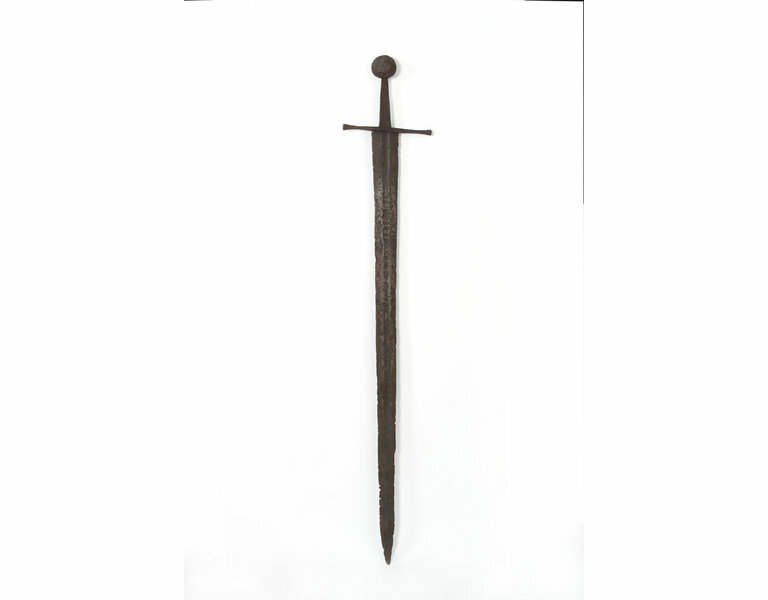 This style of sword derived from the broad straight swords of the Celts and Vikings, consisting of a long, two-sided blade balanced by a pronounced pommel and straight quillons (cross-bars on the hilt) to guard the hand, with a grip of wood bound with leather or cord. No trace of the grip on this sword remains, only the core steel tang reaching to the pommel. The medieval sword was at first designed as a cutting weapon but by around 1300, when this sword was made, narrower, pointed blades emerge in order to pierce the new plate armours. The medieval knight used a shield or armour for defence so that swords were designed almost entirely for offence to be wielded one-handed on horseback. Longer grips emerged after 1250 so that the sword could be held with two hands in foot combat and the quillons started to curve towards the blade as a form of defence for catching an opponent's blade. The earlier wheel shaped pommels were also replaced conical or oval ones. Swords are frequently portrayed in manuscripts making it possible to trace their evolution after about 1250. The armouries in Dresden and Vienna contain many medieval swords in excellent condition. Battlefields are a disappointing source for the discovery of swords implying that swords were highly prized and expensive.